I HAVE been scouring eBay and Etsy looking for a dress similar to the sundress I was wearing in my last blog post. Granted, it was always going to be hard to find an adult version of a frock worn when you were a child but my work Christmas party has a back-to-childhood theme and I was hoping to frock up in a 1970s sundress, navy blue JC sandals, with basket and all. 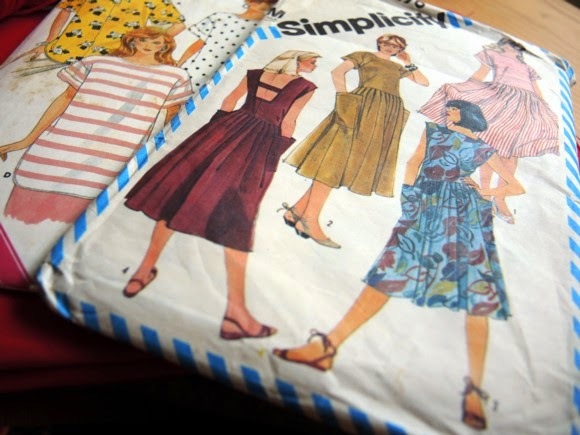 There's no time for making a dress, so I am hoping my quick eBay purchase, quite literally just now, will fit the bill - and fit me, what's more. If you think you've something closer to the original lurking in your closet, do let me know. I READ… Nothing new. I did start Patti Smith’s Just Kids. I did buy two guidebooks for a planned trip to New York next year (I know, I know, recommendations most welcome) and I did download three audio books to use up my Audible credits. I WENT TO… Camp. Yup, another Girl Guide camp. This was a big one. The planning nearly did me in, but the effort was well worth it. I LISTENED TO… Ani di Franco’s new album, Allergic to Water, and Christmas tunes from jazz greats. Eartha Kitt singing Santa Baby is sinful. I ATE… Honey drawn straight from a friend’s beehive. Damn, it was good. I OP SHOPPED… Another addition to this monthly list but the op shopping and op shopping boasts are far and few between these days so I thought I'd document the best of what meager hauls there are here. Summer sundresses seem to be the flavour of the month at the moment - or at the very least my desire to be wearing them. This pattern will get a run over the Christmas break. I do love a dress with deep pockets on the skirt. I MADE… A pom pom, or two. Little pom poms to attach to Christmas parcels. I also drew the design for this year’s annual Christmas tree decoration. The plan is to screen print it onto denim, back it with a floral, add a little cardboard in between, add a hanger and, bam! Merry Christmas, one and all. You know what they say about ‘best-laid plans’. ‘Til next month peeps. That dress sounds glorious. I do love a halter top too. That dress (your eBay find) is fabulous! I have found a few excellent op shop gems lately, but it does require constant work and a degree of fate/faith. On the book front, might I recommend 'This is not about me' by Janice Galloway. Absolutely gobsmackingly good read about growing up in Scotland in the 60s. It is pretty sweet. It's arrived and if anything is a little bigger than I had guessed based on the details. I'll be trying to alter it this evening. I love that book recommendation. It's added to my reading list for summer.